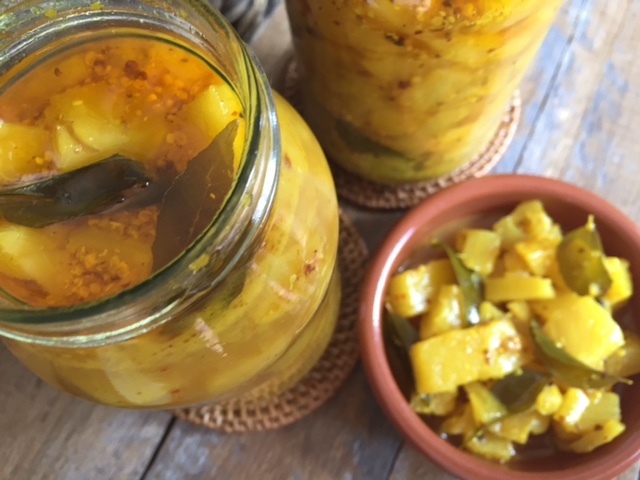 The last time I got myself in a pineapple pickle was when deliberating over the Tipsy Cake at Dinner by Heston Blumenthal, a dessert that showcases spit roasted pineapple. I’m not usually drawn to pineapple – but at Dinner I felt I’d regret missing out on the restaurant’s signature sweet treat. Not only was the Tipsy Cake fun and memorable – it also left me inspired to try something creative with pineapple at home. Pineapples, considered a delicacy in Queen Victoria’s era, are now harvested year round in Australia. 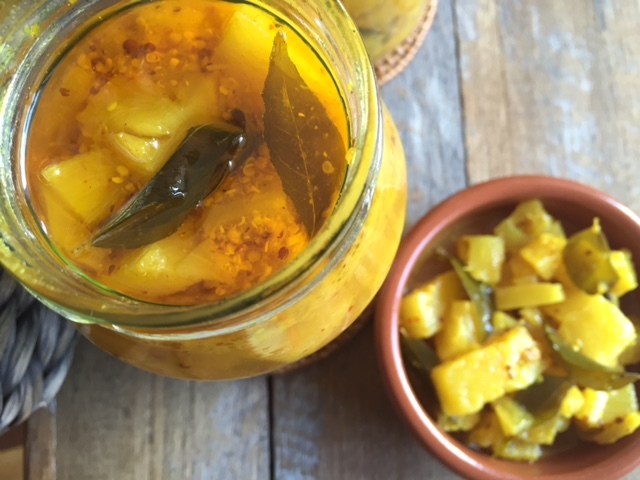 So, when Tropical Pines sent me a couple of their Pure Gold pineapples, I decided to make an Indian pickle that would preserve for months and accompany my regular homemade Indian feasts. 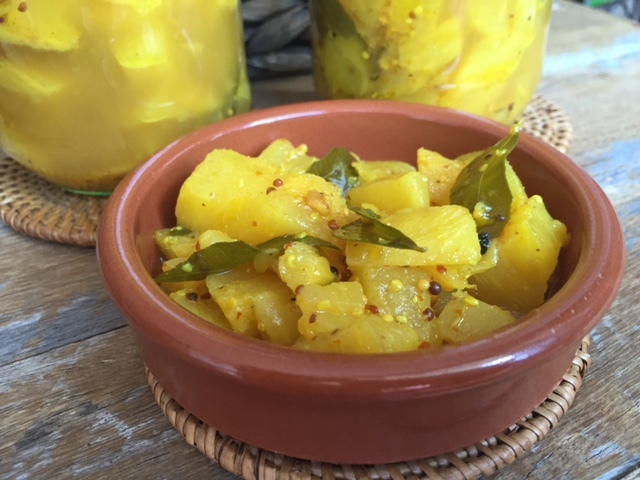 This pickle recipe is packed with health promoting spices, like turmeric and chilli. To make it extra saintly I avoided all added sugar – confident that the natural sugar in the fruit would be enough. Prepare the pineapples by chopping off the top and bottom off and then slicing off the bark – to leave just the pineapple flesh. Cut the flesh into 1cm slices and then cut each slice into small cubes, removing the firm centre or core of each slice. Heat the coconut oil in a large pan and once hot add all of the spices and the curry leaves. Once the mustard seeds start to pop (this will happen very quickly) add the chopped pineapple flesh followed by the vinegar. Heat until it comes to a simmer and then continue to cook gently until the flesh is soft and jam like. Allow to cool slightly then transfer to sterilised glass jars. I used pineapples from Tropical Pines, Australia’s largest, and family owned, pineapple producer. They pack over one million cases annually – that’s no mean feat when you consider that each pineapple plant produces only one pineapple every two years. Their new ambassador, well known chef and restaurateur, Ian Curley is promoting the health benefits of pineapples and the year round availability. To find out more visit King of Fruit. 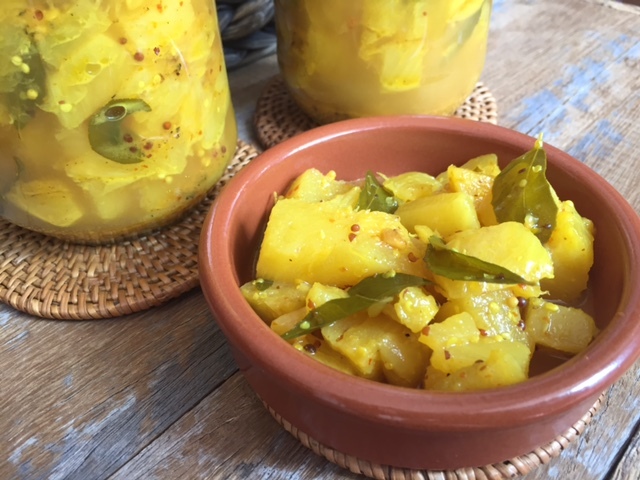 Tags: Indian, pickle, pineaple, recipe, relish. Bookmark the permalink. Thanks! Yes it would pair so well with one of your lovely curries – give it a go! Love this recipe. Yellow mustard seeds are the only things I’m missing. I shall hunt them down tomorrow!! Thanks Lisa – you could easily use just black mustard seeds instead…. Wow that sounds very yummy! !